Welshman George Overton was a leading builder of iron tramroads, designed principally for horse-drawn wagons. However, he is stongly connected to the early days of steam as he engineered the Merthyr Tramroad, which steam pioneer Richard Trevithick (1771-1833) used to test his Penydarren steam locomotive, and did survey work for what became the Stockton & Darlington Railway — the first permanent public steam railway in the world. Despite this, Overton firmly rebuffed the idea of a national steam rail network, believing horse power to be superior. We know that he was born in 1774 and that his parents were in North Herefordshire at the time of his baptism but the first two decades of his life are a mystery. 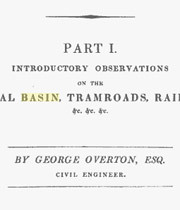 Much later, in his 1825 publication, A Description of the Faults or Dykes of the Mineral Basin of South Wales, he would describe himself as a practical man who had made and used tramroads "... during the greater part of the last thirty years ... having surveyed and constructed roads of some hundred miles' extent in different parts of the kingdom ..."
To begin with, Overton was working in the Merthyr Tydfil area, where five major ironworks were established between 1759 and 1784. His earliest reported tramroads (1791-3) connected one of these, Dowlais Ironworks, with its limestone quarries and the newly-built Glamorganshire Canal. Horse-drawn wagons moved coal and iron, and his scheme enabled each horse to pull 9-10 tonnes going downhill. By 1799 Overton was working on the Merthyr Tramroad in the same area, commissioned by the owners of three of the foundries to counter the control the owner of Cyfarthfa Ironworks held over use of the canal. The tramroad was nearly 16km long and ran between Merthyr Tydfil and Abercynon. Trevithick's steam test took place here in 1804, two years after Overton completed his supervision. From 1803, Overton had an interest in Hirwaun Ironworks in the Cynon Valley, as a partner in Bowzer, Overton & Oliver. He constructed a tramroad from Hirwaun to Abernant (1806-8), followed by work on the Llwydcoed Tramroad for the Aberdare Canal Company, and Brinore Tramroad. In 1818 he was consulted by mine owners in County Durham, beginning his involvement in the development of what became the Stockton & Darlington Railway. Two canal schemes had failed to materialise and Overton recommended a horse-drawn tramway. His survey detailed an 82km route that he costed at £124,000, and was the first ever survey for a railway. After difficulties with landowners and re-surveys in 1819 and 1820 to shorten the route, his work was taken forward to Parliament but on the passing of the Bill, steam railway pioneer George Stephenson (1781-1848) took over. Stephenson's team undertook a new survey and the rest, as they say, is history. Overton had very definite ideas about tramroads and railways and how to construct them. His design for wooden trams (wagons) was adopted across most of South Wales. His expertise in this field seems to have prevented him from fully appreciating the advantages of steam locomotion "... except in particular instances, and in peculiar situations." His last project was Rumney Railway, a plateway from Rhymney Ironworks to the Monmouthshire Canal Tramroad near Newport. It opened a year after the Stockton & Darlington Railway. In the 18th century, tramroads were an integral part of the country's transport network, often constructed by canal companies or industrial concerns to link with canal schemes. At first, they featured timber rails, and carried raw materials, finished goods and people in horse-drawn wagons. 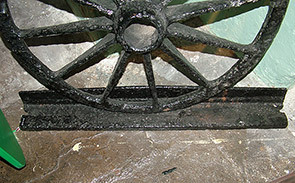 The first iron rails were cast at Coalbrookdale in Shropshire in 1767 and used locally. Early metal tramways (plateways) used flat metal plates or L-sections on timber or stone sleepers. A network of canals and tramroads was used in South Wales to transport coal, supplying the many ironworks and distributing the products they made — as well as serving other industries. The first metal-edged tramroads (1791-3) served the Dowlais Ironworks near Merthyr Tydfil, and many more were built in the following decades. Gauges varied widely. The Merthyr Tramroad (1802) used L-section rails on stones. The first run of Trevithick's steam locomotive took place on 21 February that year, followed by at least one more trip before the engine was put into stationary service at the Penydarren works. Merthyr Tramroad continued to use horse power, sometimes in conjunction with steam, up until 1830. 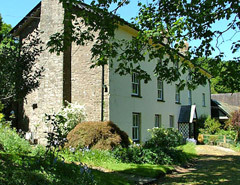 Llanthetty Hall (now Llanddetty Hall Farm) in the Brecon Beacons National Park, Powys, where engineer George Overton and his family lived from about 1815 onwards. It was built in the 17th century and is Grade II listed. 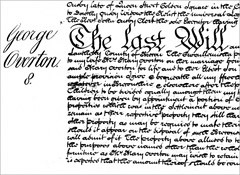 Detail of Overton's will. He died in 1827. 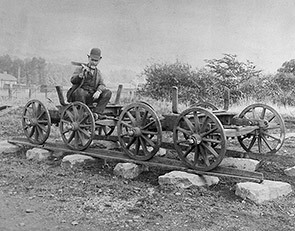 Photo of a demonstration installation of a section of Merthyr Tramroad (1802) with two wagons. The tramroad ran from Merthyr Tydfil to Abercynon and was engineered by Overton for the use of horse-drawn wagons. The photo show the section loaned to the World's Columbian Exhibition at Chicago in 1893 for a display on the development of the steam engine. A section of L-shaped iron rail from the Merthyr Tramroad on display at Cyfarthfa Castle. The plateway (railway) was made up of short sections spanning stone blocks. Merthyr Tramroad was almost 16km long. 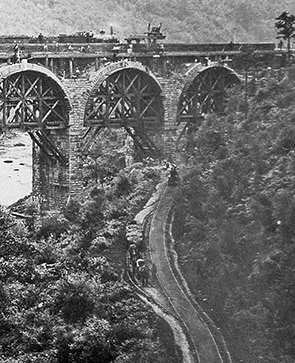 In this detail of an 1862 photograph of the widening of Brunel's Quakers Yard Viaduct (Goitre Coed), the Merthyr Tramroad can be seen in operation. It's the earliest known photograph of it working, and shows a south-bound horse-drawn wagon group having just given way to a northbound train. Overton constructed the Llwydcoed Tramroad for the Aberdare canal Company while he was their resident engineer. he probably also designed the cast iron Robertstown Tramroad Bridge (1811) shown above. 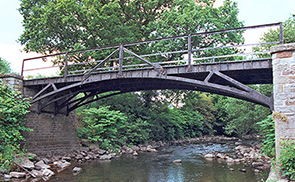 It carried the plateway over the River Cynon at Aberdare and is one of the oldest surviving such bridges in the world. 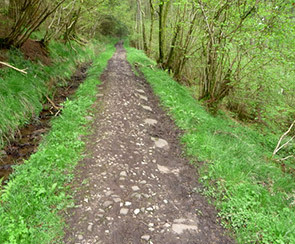 These days, many of the former tramways in Wales are used as footpaths, and Overton's Brinore Tramroad (completed 1815) is no exception. The remains of stone footings for the iron plate rails are clearly visible on this stretch by Talybont Reservoir. The Bassaleg Viaduct (1826) is probably the only surviving engineering work of the Overton-engineered Rumney Railway (plateway). It's also thought to be the world's oldest railway bridge still carrying full loads. 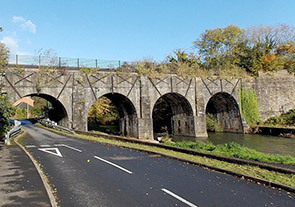 Of its four masonry arches, two span the River Ebbw in Newport.